8.9 on the Richter scale. That’s one way to get me back writing on this blog of mine. Thank you everyone for your messages of support and well-wishing. Everyone I know is safe. I had friends walk for 2 to 8 hours to get home last night. News reports showed all bicycles had been sold out in Tokyo. My father-in-law drove through streets with no working traffic lights. He said the traffic was slow but orderly with drivers hand-signaling each other at intersections. We were most worried about Tomoko’s 90 year old grandmother. She lives by herself in a small farming village near the epicenter. But we got word that she was perfectly fine. And her village, inland and on high ground, was largely unscathed. What a miracle! Last night there were millions of people stranded in Tokyo unable to get home in the suburbs (Tokyo’s population doubles during work hours). But that’s nothing compared to the calamity from earthquake, fire and tsunami on Japan’s northeast coast. The worst thing that happened to us personally is that the microwave fell off the shelf and got mangled on impact. The electric kettle also broke, having flown off the shelf. But I’ve been able to rejigger that to get us some hot water. Books and DVDs had toppled onto the the floor. Plants fell over. And anything on a table had a 50% chance of finding itself on the floor. And thankfully that was it. Tokyo is extremely lucky that it mostly escaped any major damage. We were merely inconvenienced. Trains were stopped to check for track damage. Gas was turned off as a precaution. Cell phone networks were understandably overloaded. Our elevator was stopped so we climbed the stairs to our 8th floor apartment. But that was good exercise. Otherwise most of us still had electricity, water and internet. I was especially lucky that it was my day off and I was with my family, walking distance from home. This morning, our neighborhood was quiet and introspective. Since it was a beautiful day we ventured out and found that about half the shops were closed. At the supermarkets, there was very little food on the shelves, and there were long lines at bakeries and convenience stores. People were somberly stocking up on food and supplies. Fortunately we weren’t in our apartment during the quake. The violent sway of the building and things crashing probably would have scared the bejeezus out of us. And it probably would have traumatized Moka who just turned 6 months a few days ago. 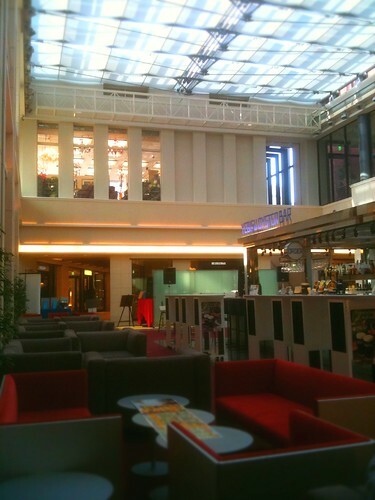 Instead, we were at our favorite drinking hole, an airy cathedral-like cafe/bar in the center of an atrium. There’s glass everywhere in this usually relaxing space. The ceiling is glass, and there are high windows all around. Also, towering over the atrium is an adjacent 49 floor building. First there was a low rumbling roll like any number of earthquakes you experience in Tokyo, but then the windows started warping and the ground started groaning. Once the light fixtures started violently rattling, I scrambled with Moka in my arms under the cover of the arcade surrounding the atrium. I just wanted to get her out from under potentially falling glass. This was the only time Moka cried out, startled by my sudden movement. Tomoko told me I did this without telling her what I was doing or where I was going. I don’t really remember. Adrenaline and instinct kicked in. The next thing I was aware of was trying to keep my balance with the ground bucking and rolling. We were watching the bartender futilely try to keep the bottles and wine glasses from falling. Tomoko yelled out, “What are you doing? Get out of there!”. But it’s just instinct. You see something falling, you try to keep it from falling. I was bracing myself for the shattering of glass that never came. Amazingly, the ceiling and the windows remained intact. After the main earthquake passed, which lasted a long time, we sat back down and stayed put for a couple hours. There were announcements that warned us to stay indoors. We figured if the glass didn’t shatter with that one, the aftershocks wouldn’t be able to either. Plus the world’s most stringent building codes probably wouldn’t have allowed glass ceilings unless they were shatter resistant. Or so we hope. There were other announcements asking restaurants not to cook anything. And eventually, the shops were told to close up. On the way home we saw crowds of workers making their way out of the buildings and setting off for the long trek home. The remarkable thing was that all this was done in the orderly way Japanese people are famous for. There was no mass panic. No looting and rioting. My favorite tidbit of civil service? Suntory, a beverage company, disclosed that there was a hidden lever in their vending machines that released free drinks. But now the real work begins. It’s stunning to see the mind-numbingly extensive havoc wreaked up north. Hopefully, the reactor becomes contained, and no other tsunamis wash ashore. Thank you everyone for checking in. We’re unnerved, but grateful. Thanks Wind! Glad to know you and your family are safe, and that the old farming village still proved to be a good place to be at a time like this. Oh, Wind, what a relief to find that you and your family are OK. Thank you for this post. We are praying for the people of Japan at this difficult time. What a great personal report! I am thrilled that everyone that I have been in touch with has merely had their lives interrupted. The Suntory element is awesome! I am once again amazed, but not surprised, buy the performance of the Japanese people. An example for us all. Erin and I are thinking of you three and everyone else every day. Please take extra precautions with yourselves and thank you for keeping us updated on your state. I am happy to hear you are perfectly fine, and it is really interesting to hear your story. Thank you for sharing, and thanks to Kevin too for sharing it. Thank you for this account, for sharing your experience. So grateful you and your sweet fam are safe. So much love flowing to you and Japan. Great common sense here. Wish Id toguhht of that. Glad to hear your news and very glad that Moka and family are safe. It definitely seems that the atrium was built for earthquakes. We’d love to hear more from you guys as things move forward. As a soon to be dad, the radiation seems the biggest threat for all of us but especially little ones. Keep safe. thank you everyone! i really appreciate the words of support. please don’t worry about us. tokyo is more than fine. but the people up north really do need our help. i’ll continue posting and updating as much as i can. A wonderful telling of the *real* news. Why did I bother watching CNN when I could have been reading this? Great to know that you and your loved ones are all ok. If Canadians could prepare in any way for future disasters, I think it would be to individually adopt the peaceful, restrained and cooperative manner of the Japanese people.